I like how they turned out, nice individually or maybe I should link them together into a garland. I could see them wrapped around a tree, maybe made with some fancy sparkly yarn…although simple is often best. Anyways, I did make a diagram so I didn’t forget how I did them! Oooh lovely – I can see them in metallic thread hanging on a Christmas tree…. 😦 wish I could read charts! Your stars are beautifully made and I can see them on a tree, in a window, decorating a package instead of a bow…. so many possibilities…. 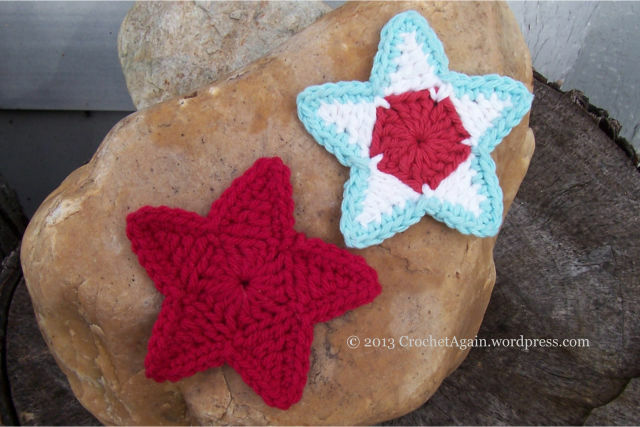 These stars are just lovely! 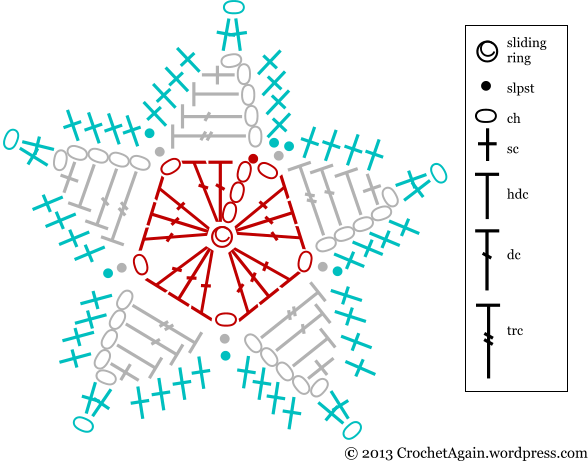 Thank you for sharing the pattern and for giving an easy to understand diagram to follow. That will be a great pattern to use at Christmas time! I really like the one in three colours because it shows up the pattern so well! I love you pattern! Thanks so much for sharing it! I made some from a Doris Chan pattern that I’m not too fond of. These are wonderful! I have looked at many tutorials about the magic circle. However, none of them tell you what to do with the tail to secure the tightened hole or hide the rest of the tail. Can you elaborate? Thanks. You weave it in, no different then having to weave in the tail if you were using a chain/slpst to form a ring to start. It stays secure enough that I leave that until the work is finished. These are beautiful. Thank you for sharing. I think they will be beautiful on a Christmas tree. Your stars are so pretty! Last year I made a bunch of them and put on my Christmas tree – I like your pattern, can’t wait to give it a try! I just wanted to come back and tell you that I’m really enjoying making the stars you so kindly put up here! They are quick to do and look so effective with a different colour edging. There will be stars everywhere in my apartment soon! They also make great gifts! Wonderful! Thank you! super cute just wish I understood how to read the chart. I tried to figure it out but doesn’t seem to be working out once I get passed the second row. Is it just one triple crochet and the then slip stitch into the chain one space? Any suggestions? Love these – Do you have an actual written pattern – having trouble understanding the chart. Thanks. Sorry, I only made the chart for it as I went along. The chart is in the same colors as the 3 color star in the photo, if seeing one for real helps in any way. If you have a specific question I can try to explain. 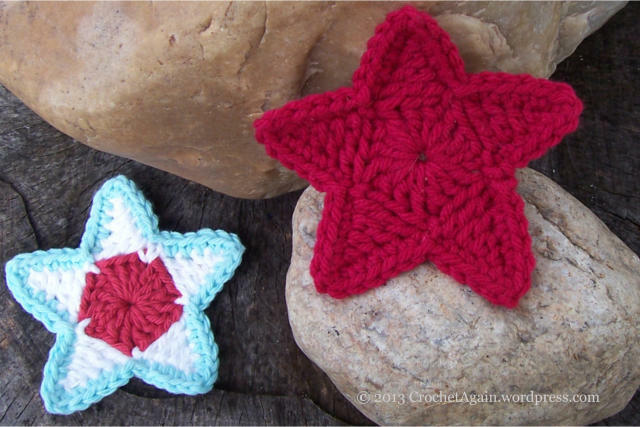 When I crochet a star that is a different color than the surrounding stitches, I slip stitch in the new color around the stitch and then make the surrounding stitches into the slip stitch. It makes, for example, a white star on a navy blue surrounding background much crisper.